Oops - we don't appear to have a video for the SmartOffice PN2040. An easy of use network attached document scanner that helps to streamline business processes. The Plustek SmartOffice PN2040 scanner is an easy to use network based scanning solution for sharing documents in today's multi-location and global environment. 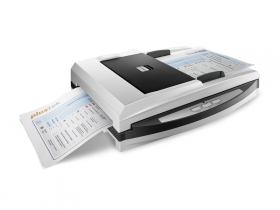 The PN2040 makes document scanning easy and efficient. Simply plug the scanner into your office or home network and you can scan to any PC that is connected to the network. The SmartOffice PN2040 also features a USB interface is you would rather use the scanner directly connected to a PC.